The company Kyocera TCL Solar LLC began construction in December on a new floating solar power plant located on the Yamakura Dam reservoir in Japan’s Chiba Prefecture (Goode, 2016). Floating solar arrays are gaining popularity worldwide, with installations also in the United States and Australia. ‘Floatovoltaics’ have several advantages over land-based solar arrays. Buying or renting land is more expensive than renting space on a reservoir or body of water, and there are fewer regulations for floating farms on non-recreational bodies of water. They can also keep water from evaporating, which makes floating solar an appealing idea for areas affected by drought (Goode, 2016). Land for solar farms is scarce in Japan, so companies like Kyocera have begun to innovate and create floating solar farms. Benefits: a) Efficiency – The water surrounding a floating solar panel cools the panel and increases efficiency. This means that a floating panel produces more electricity than a similar ground-based panel (Blackwood, 2014). b) Evaporation – Placing solar panel cover on a reservoir, lake, or other body of water prevents evaporation. c) Land usage – Placing solar farms on reservoirs allows land to be available for other uses. Drawbacks:a) Cost – floating mounting systems are more expensive than regular ground-mounted platforms. c) Ecosystem impact – although Kyocera claims that its’ floating platforms will reduce algal blooms, the ecosystem impact of the reduction of UV rays in reservoirs is yet to be fully understood. 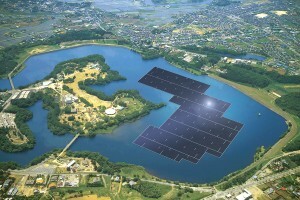 Environmental impact: The floating solar array will generate approximately 16,170 megawatt hours per year, which is enough electricity for around 4,970 typical Japanese households. This clean energy will offset 8,170 tons of CO2 emissions annually, which is equivalent to 19,000 barrels of oil (KYOCERA Solar, 2016). Obviously, this solar farm will be a huge step in the right direction in terms of producing carbon-free renewable energy. If this project is economically profitable, then Kyocera will probably pursue dozens more projects on reservoirs in the coming years.